The performers in Tuesday night’s BPC show, Innovate: The Berklee Electronic Digital Instrument have all made significant contributions to how musicians use technology to perform. 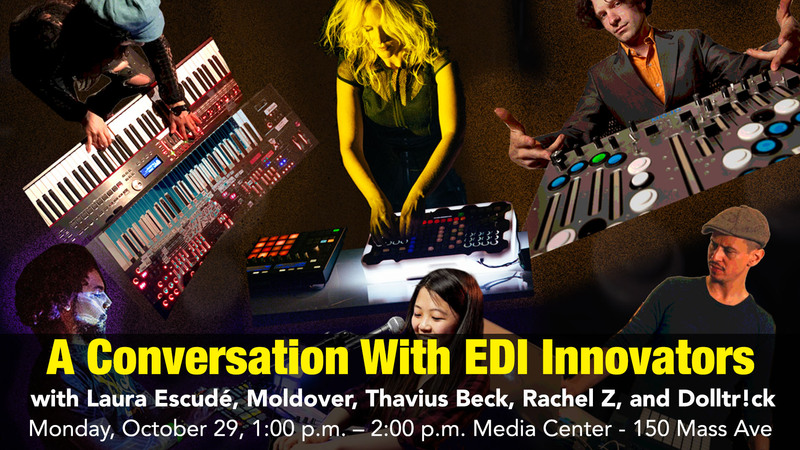 Join us for this panel discussion where they will share their perspectives on electronic performance. Coming from a background as a classical violinist, Laura Escudé embraced early controllers and Ableton Live to develop her own hybrid performance practice, and has worked with artists from Herbie Hancock to Kanye West, helping them use this technology in their live performances. Berklee alumnus Matthew Moldover, quickly realized, while playing parties in Brooklyn, that audiences didn’t respond to musicians huddled over computers, and became the “Godfather of Controllerism” developing his own unique hardware controller, devising ways for electronic performance to be a social activity, and blurring the line between guitar and controller. Multi-instrumentalist, producer, emcee, and electronic music educator, Thavius Beck combines the worlds of Hip-Hop and Rap and his love for sampling and electronic music production with influences from rock, soul, experimental, and industrial music in his performances. Rachel Z and Dan Freeman are both adventurers using technology in performance. As a highly respected Jazz musician, Rachel brings an improvisor’s sensibility to all forms of music, and her work with Brooklyn producer Dan Freeman showcases the best of Jazz and groove music. EPD alumna Claire Lim performing as Dolltr!ck is establishing a voice as a wired pop producer/performer, who shows us that a an artist with deep technology chops can also be a thoroughly engaging performer.